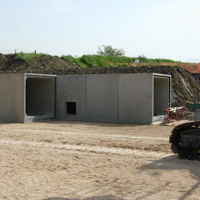 Precast concrete box culverts are the ideal solution to a wide range of construction applications. Their traditional use is for diverting watercourses. Available in a wide range of sizes, the versatility of these structures has seen them used for many other applications. These include attenuation tanks, pedestrian subways, access shafts, service tunnels, sea outfalls, road crossings and a variety of other applications. In all cases where strength, durability and economy are of paramount importance. 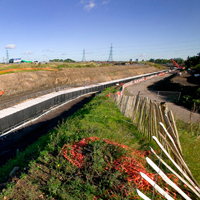 Members of the British Precast Drainage Association (BPDA) design and manufacture box culverts to meet specific applications and loading conditions. BPDA members produce a standard specification which covers materials, manufacture, tolerances, external loading, design and detailing. The specification includes a check list and a compliance certificate. Box culverts which are to carry highway or railway loading are designed to the standards and specifications as stipulated by the client. Proven strength, performance and long service life. Unlike structures manufactured from other materials such as steel, precast concrete culverts do not require additional protective treatments to prolong service life or improve performance. They do not rust and the smooth internal finish of the concrete ensures efficient flow characteristics. Prolonged service life with minimum maintenance makes precast box culverts an attractive, versatile and economic solution. This is one of the most common uses of box culverts enabling development of land which is crossed by watercourses. They offer economy combined with capacity to meet design flow rates with headroom and width restrictions. Lengths of watercourse in excess of 1000 metres have been culverted. Where necessary, skewed units can allow for changes in direction. Openings for access and pipe entry can be incorporated during manufacture and smaller diameter holes can be core drilled during installation. Channels can be provided, with or without removable lids, thus enabling a wide range of applications from open water course diversion to service ducts for pipes and cables. 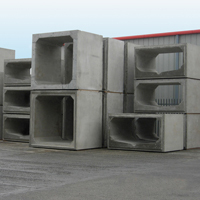 Precast box culverts can provide economical storage of storm water. These can be located under roads, car parks, grassed and other non-trafficked areas. 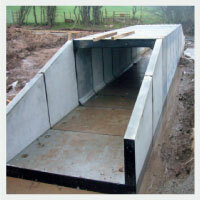 Box culverts can be supplied complete with end walls, access and pipe entry openings. They can be designed to carry traffic loads or any other loading determined by the location. Rectangular box sections laid side by side, with a nominal gap to allow for relative movement, provide the largest flow capacity in the minimum space. Precast box culverts offer a cost effective solution and a quick means of construction, thus minimising road closures and disruption. Sections can be provided with headroom for use as pedestrian subways. Underpasses for cars and light commercial vehicles can be accommodated with larger units. Provision can be made for lighting and incorporation of special finishes. 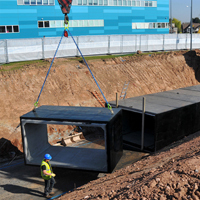 Box culverts can be designed with as little as 200mm cover and where necessary, for no side pressure relief from the ground. As such they are a perfect partner to precast concrete pipes where higher loading and maximum flow cross section is required. Precast concrete is inherently resistant to fire. It is an ideal solution for rapid, safe underground escape from industrial and commercial premises, car parks, shopping centres and sports arenas. 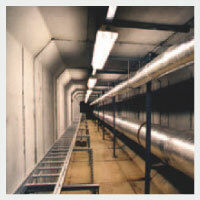 Precast box culverts are an excelent choice for accommodating and maintaining underground services. Box culverts can be designed with increased cover to reinforcement and with effective crack control to resist extreme conditions. For example, box culverts may be stacked vertically to create access shafts for deep utilities where ancillary valves and pipework are located.